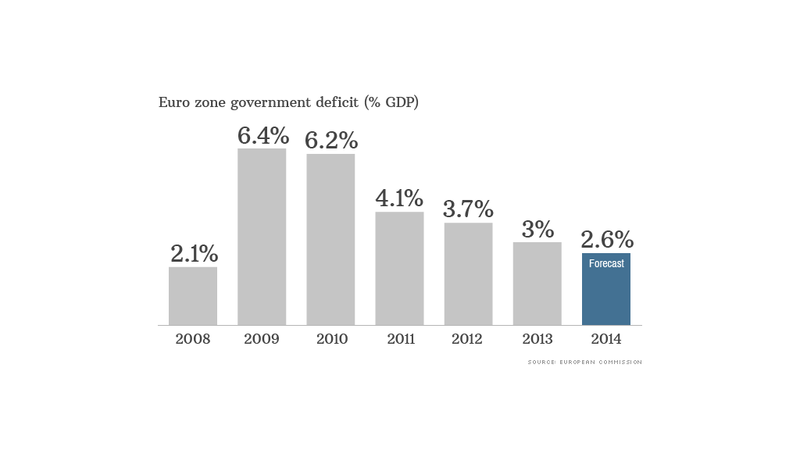 The eurozone kept government borrowing under control last year, meeting its own limit for the first time since 2008. It was one more layer of evidence that the region is emerging from a devastating debt crisis. Net borrowing by the 18 governments sharing the euro totaled almost €293 billion ($404 billion) in 2013, €59 billion less than the previous year. That was right in line with the limit of 3% of GDP set in European Union laws designed to underpin the currency. Government deficits ballooned in 2009 and 2010 as Europe grappled with the fallout from the global financial crisis. Years of austerity followed, particularly in bailed out countries such as Greece, Portugal and Ireland, depressing activity and sending unemployment to record levels. The reforms have helped restore competitiveness. Economic growth returned in late 2013, and has showed signs of picking up a little this year. A survey of purchasing managers this month found business activity in the eurozone accelerating at its fastest pace in three years, and not just in core countries such as Germany. "Perhaps the best news came from the rest of the region, where the fastest rate of growth seen since early 2011 suggests that the recovery in the 'periphery' is gaining traction," noted Markit chief economist Chris Williamson. There's been a dramatic change in sentiment among investors towards eurozone economies that just a couple of years ago were frozen out of international debt markets. Greece returned to a warm reception in the bond markets earlier this month for the first time since its economy collapsed four years ago, paying a return of 4.95% to borrow €3 billion -- a fraction of the peak yields the country's debt saw during the crisis. And Portugal raised €750 million by selling bonds Wednesday, its first auction since the country was bailed out by the EU and International Monetary Fund in 2011. The new debt carries an average yield of under 3.6%, down from more than 18% just two years ago. Still, European Commission data published Wednesday show there's still a long hard slog to come. Only one eurozone country -- Luxembourg -- managed a budget surplus in 2013. Germany balanced its budget, but the region's second biggest economy France recorded a deficit of 4.3%. However, most countries are still running deficits, and some face the possibility of providing more aid to banks when regional stress tests are completed later this year. 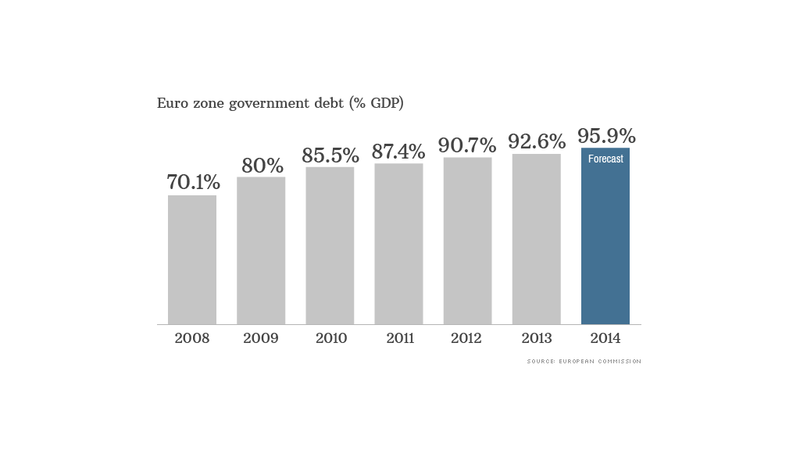 Eurozone governments have accumulated record debt of nearly €8.9 trillion, equivalent to nearly 93% of regional GDP. For some countries, the mountain is even higher. Greece has borrowed 175% of national GDP. Italy's ratio is 133%, and Ireland's 124%. And even though Germany brought its debt ratio down to 78.4%, Europe's biggest economy is still years away from meeting the limit set out in EU treaties. "At this rate, Germany would be fulfilling the 60% debt ratio criterion in 2020," noted Berenberg economist Christian Schulz.